In Christensen v. Alaska Sales & Service, Inc., plaintiff and her husband purchased a new car from a dealership. Four years later, the couple was driving when she hit two moose. Pictures taken by plaintiff show damage to the front of the vehicle on the driver’s side. When police arrived, plaintiff said she felt nauseous and could not remember anything about the accident. She had a red mark on her forehead. Following the accident, her speech became disfluent, and she was difficult to understand. She also had trouble walking and would fall frequently. A neurologist ordered an MRI and diagnosed plaintiff with bilateral frontal lobe brain damage. As our Boston car accident lawyers understand, cases involving traumatic brain injury (TBI) can require expensive medical treatment and rehabilitation for many years following the accident. Shortly after accident, plaintiffs took the car to a repair shop where they learned that both driver and passenger seatbelts were not functioning properly. Plaintiffs attempted to get the dealership to pay for the repairs, but, when it refused, plaintiff’s insurance company paid for repairs. Plaintiffs were never given the old seatbelts back after new ones were installed. Plaintiffs filed a lawsuit against the dealership alleging that the seat belts were defective and had caused the injuries. During the discovery process, defendants took the deposition of plaintiffs and obtained an affidavit from an expert. Defendant filed a motion for summary judgment, alleging plaintiffs had not established the seat belts were defective. The court granted motion for summary judgment. Plaintiffs filed an appeal to the court’s decision to grant summary judgment. On appeal, the court looked at the issue of whether, if all the evidence were true, a jury have enough evidence to find defendants liable for injuries to plaintiff. In other words, was there a genuine dispute as to material facts to allow the court to reverse the trial judge’s decision to grant motion for summary judgment. The appellate court reasoned that plaintiffs had presented enough evidence that it would be possible for a jury to find in their favor. It should be noted that this does not mean that plaintiffs will win the case, only that a jury could possibly make such a finding. Some of this evidence included the testimony of plaintiffs that, when pulling the seat belts forward on some occasions, they would not lock or retract properly. After replacing the seat belts, there were still problems with the locking mechanism on the driver’s seat belt. This would support the allegation the mechanism was defective at the time of the accident. 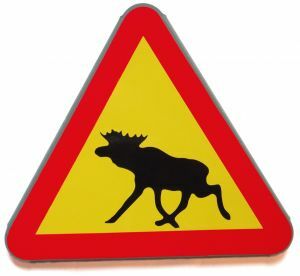 Driver testified that, when she hit the moose, the only mark was the one her forehead. She was wearing her seat belt as she always does, and, if it had been working properly, there would have been other marks and bruising on her body caused by the seat belt restraining her. The court stated that whether plaintiffs will ultimately prevail at trial is irrelevant at the summary judgment stage of the proceedings. There is a genuine dispute as to material facts, and a jury should make a determination, not the judge.